Unlucky 013? Ha! This one’s a pearler. 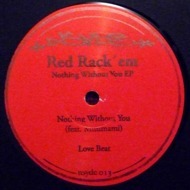 Multi talented producer Red Rack’em climbs up the fertile n s y d e spirit tree for this glowing summer release in the form of the ‘Nothing Without You’ EP. A mutation from the same skunky-soul strain of n s y d e 005 by Skymark / Lady Blacktronika. Misumami weaves an enchanting story of longing, and matters of the heart, through signature sleek, clever, floor ready Rack’em production. Flip for ‘Love Beat’ and here we get Red Rack’em- the Funky Technician fanboy, dusty fingered Native Tongue devotee, and closet Jazz dancer. The loose, bumping drum programming and sculpted, cubist jazz sampling (inna heavy Mandalorian funk fashion) weld this nocturnal seduction dance together. This is a late night groover, an eyes closed on the dance floor vibration.